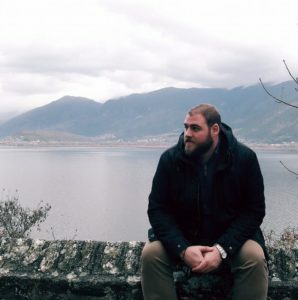 He developed the Battle of Crete tours and the blog for the agency and he is guiding around the battlefields of Crete. He is a sergeant in reserve of Greek Artillery Corps as he finished with his services on June 2015. He is very passionate with 20th century’s war history and in love with the island of Crete. Sean, is 58 years of age, and was born in the UK, of Anglo-Irish ancestry. 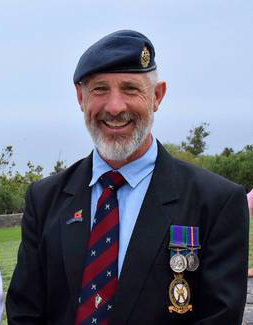 He moved to Crete in 2005, having served for 23 years in the Royal Air Force Regiment, in a capacity necessitated by battles such as that of Crete, in May 1941. From an early age he found himelf fascinated by the ‘Battle of Crete’, as he listened to his uncle’s stories of his days in the Royal Navy. His uncle had taken part in the campaign, serving on board the cruiser HMS ‘Orion’, which played a major role in both the ‘battle at sea’, and subsequent evacuation of Allied troops from the island. Arriving on Crete, his wife and him, found themselves living a mere three kilometres from Maleme airfield, and he was able to spend a lot of time retracing the footsteps of those who had served in the Battle of Crete, and reading anything he could lay his hands upon regarding the battle. He enjoys sharing his knowledge (and learning from others) of the details of this extraordinary battle, and the following four year occupation & resistance. Born in Piraeus (1938), son of a shoe-maker. After the course of high-school (1956) he participated in Cadet school of Greece. In 1959 he nominated Second Lieutenant of the Greek Cavalry. 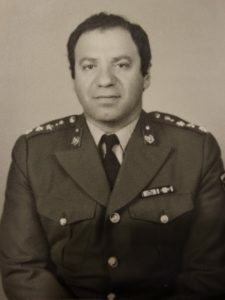 In 1961 after another success in exams, he joined the Technical Corps of the Army and continued his career as a Technical Officer up to the rank of Major General. He served as Chief of Technical Corps and he retired in 1992. During his service in the army he attended all relative training of his specialty. He graduated the Greek Military Academy. In 1964 he was admitted the 3rd class of Greek Polytechnic School (Electrical and Mechanical Engineer). He served in all places and posts according to his rank and took all training needed to his duty either as student or teacher. Commander of Tank-Cavalry of different units. Commander of School and camps of recruited personnel and officers. Technical training as Chief of Work in Military factories in France, England, Italy, Spain, Germany, Holland, Israel and USA. 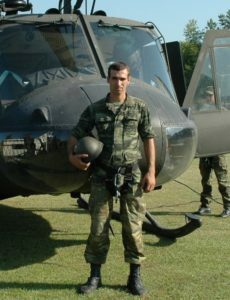 He served for 2.5 years in Greek Embassy in Paris as Procurement Officer and Quality control participant in inspection of army material. Next to his retirement he worked for 6 more years in Greek military industry. Today in his 81, he is still reading and learning things about the 20th century’s military history and love to share his knowledge. Stelios is 35 years old, born and raised in Galatas, a village 5km outside Chania with a big history during WW2. He studied in Eastern Macedonia & Thrace Institute of Technology in the Department of Petroleum & Natural Gas Technology. In 2008-2010 he served in the Greek Special Forces as a reserve Second Lieutenant. He served in 1st Paratrooper Battalion in Maleme and specialized in mortars. Today he works as a security guard in a local company. In the meantime he is a shepherd and has many sheep in Galatas. His interest about WW2 history started in primary school and in 1999 he started to collect war relics from his area. Today he has more than 40.000 items from the Turkish Occupation of Crete (1669-1897) until the Second World War. All these are presented now in his house that has become a small war museum. He also collects WW2 original photos from german personal archives and 224 of them were published in 2015 in his book “The Battle of Crete through unpublished photography”. He is more than happy to welcome people to his collection and guide them, explaining every single detail behind each object.